The name of our Garden District bike tour is the English rendering of city's official symbol...the Fleur-de-lis. 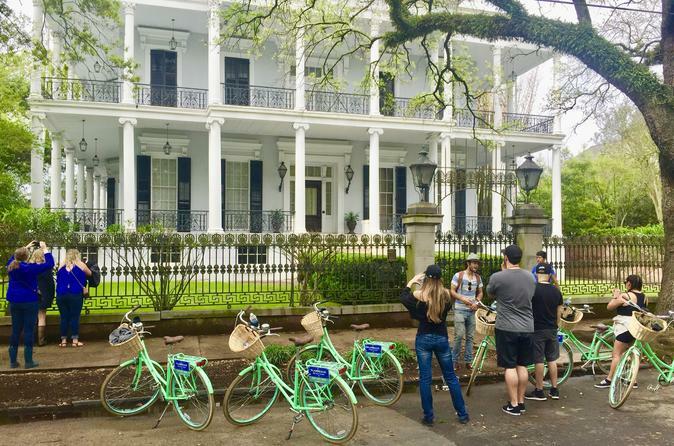 On our 3 hour Flower of the Lily bike tour you will learn about the Garden Districts evolution from the French colonial period, it’s status after the Louisiana Purchase, and its development into the regal neighborhood that it is today. Trees that grow Mardi Gras beads, histories the most creative author couldn’t make up, celebrity mansions, above ground cemeteries, and a charm that only our city can bestow on its visitors. Join us on this urban adventure through one of the most majestic neighborhoods in New Orleans. The Flower of the Lily bike tour starts at 10am at Flambeaux Bicycle Tours location (626 North Rampart St. in the French Quarter). Upon arrival you will fill out a waiver and be fitted on a bicycle to make sure your comfortable on the tour. After a short safety briefing you will embark on a 3 hour excursion from the French Quarter, the Garden District, and back. On your 3 hour tour you will learn about the intersections of New Orleans various historic cultures. Your guide will show you the most impressive ante-bellum mansions in New Orleans, give you a narration of who lived in them, and the inhabitants impacts on American history. Your tour will come with a bottled water, an optional helmet, and a guaranteed good time!